This weekend I flew home for my father’s Memorial Service at the Saratoga National Cemetery in Schuylerville, NY. It was a wonderful ceremony and it was very nice to see Family that I haven’t ever met such as Greg, Paris, Mikala, and Holden Leibenguth. When I was home in July my mom and I had gotten a hold of the cemetery because we heard that they provide a military ceremony for veterans free of charge including a proper military burial. Paul, the man in charge at the cemetery, was very kind to my mother and I and spent a lot of time making sure that everything went well for us and that everything was taken care of for my father. Pastor Deane Perkins from my mother’s UU church presided over the service and his words were very kind despite barely knowing my father. 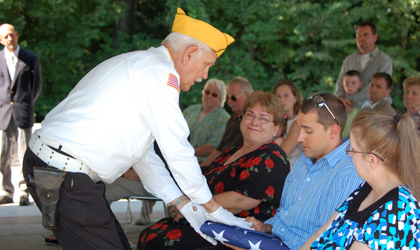 I was surprised to see that the servicemen at the service were clearly WWII veterans like my father. They acted very professional throughout the whole service standing at attention the whole time. During the ceremony the pastor asked if anyone would like to say any words. No one else wanted to so I stood up and told a couple stories about my fathers life that I found to be special. I told them about how he crashed several planes and lived, and the story about him floating down the river half dead after crashing into a mountainside. I then told them about how he seemed to measure everything in “elephant units” when I was a kid. My tree fort could hold an elephant or the rope behind my snowmobile could tow an elephant.... Even my mom hadn’t heard that about him before. I sat throughout the service with my mom on my right and Star on my left. Near the end of the service there was a gun salute x3 and two of the service men took out my father’s flag and folded it tightly up into a triangle for me. The care in which they folded the flag was amazing. Then, to my surprise one of the men knelt down with the flag and presented it to me along with three shell casings. I was so caught up in the moment and with emotion that I don’t clearly recall exactly what was said to me but I’ll always remember the sincerity of the man’s eyes as he spoke the words to me on bended knee. It was one of those moments in life that I’ll always remember. Then Paul knelt down in front of my mom and told her what the arrangements would be for my father and where he would be buried. We all walked over to the burial plot and by the time we had arrived my father’s ashes had already been placed in the ground. Sean and Fran who had driven over 5 hours to attend the hour long ceremony had to return on the long drive to attend parties they had planned. The two of them showing up was one of the nicest gestures I’d ever seen in my life and was a testament to the priority of family in the Wilcox side of my family. My father’s plot was small but very nice and I know that his spirit will enjoy the setting of the cemetery with wild foxes and deer roaming the grounds and fields surrounding it. After the service we all went to Sonny’s for some dinner. I brought my laptop and a slideshow of photos from my father’s life for everyone to look at. Greg and Paris were really impressed by all the old photos I had along with Barb and Norb. I was very happy that Bob Jones was able to make it to the service. I picked him up beforehand at his house on the lake and he was very pleased to be out with us. Bob was one of my father’s closest friends along with Ron Roemer who couldn’t make it because he was taking care of his wife. After dinner Kirby and Amy rode with me to drop off Bob at his house on the lake and snapped some pictures of us on the dock at sunset after Bob showed us all his carving studio and art (which my father taught him a great deal about). I wish that more of my father’s side of the family could have made it but I also remind myself of how hard some of their lives are and the financial burden of making the costly, long trip. I miss my father a lot. I regret that I didn’t spend more time with him in his final years but I know in my heart that he was proud of me. I am proud to be his son and I’ll always respect the memory of my father. He lived through the first cars, putting men on the moon and to an age where people find their way around town using satellites connected to their mobile phones. He saw so much in his life. I love you dad. Update 9/29/09: Emily came home today with a glass triangular case for my father’s flag, his military stripes and the shells that were given to me at the memorial service. His flag now hangs in our apartment and will hang in our future home as well. I just need to get his dog tags next time I am home. This I recorded when I was in my younger teens on a mini cassette tape. This I recorded when I came home for a visit from College. Home for New Years and recorded this.